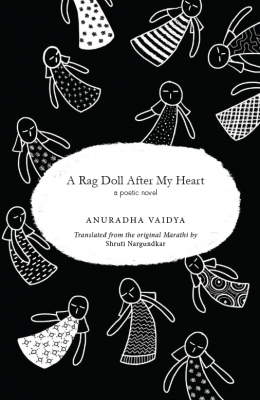 Vaidya’s niece, Shruti Nargundkar, has translated this work into English. 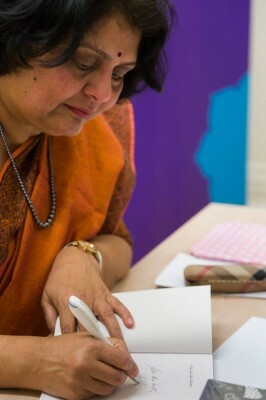 She mentions in her own introduction (playfully called “My Gambit”) that her love for the Marathi language emerged at a very early age from reading her aunt’s works, in which she saw reflections of her “family legends and stories, family traits, (her) family’s own brand of humour”. 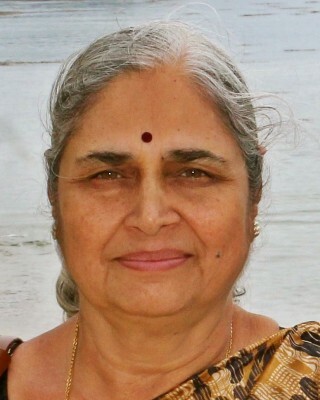 She tells me a little bit of the history of Vaidya’s writing over e-mail: as a little girl and a very young housewife, Vaidya started writing poems for herself in a notebook. Slowly, her work grew to be part of a wave of women’s writing aiming to erase the image of women as exploited, hapless creatures; inspiring women to learn to live as human beings in the present, without being oppressed by history or fearing for the future. Her distinctly feminist voice is respectful of the simpleminded traditions in which it is based. She has written across genres, and her “poetic expression blended with her talent for story telling, and a poetic novella was born.” With “fond faith”, Vaidya trusted Nargundkar to translate her work. Shruti lives in Melbourne with her husband and two daughters, and their 14-year-old kitten-at-heart cat, Shadow. Certain meanings were also at risk of being lost. Marathi figures of speech, imagery, and words do not have equivalents in English. “[Translation] struggles to make sense outside [cultural and geographical] boundaries.” Before actually embarking on the project, Nargundkar had not thought about the challenges - she was consumed with wanting to begin the project. “I soon realised that what I thought was a matter of reading and writing to establish linguistic and semantic equivalence was actually a challenge on the lexical, idiomatic and syntactic level. How does one convey the cultural tone of “footprints etching gopadma”; or what word in English could exactly convey the exact idiomatic import of the word “pallav”?” Explaining every single idiom would have required endless footnotes. She ended up using three broad strategies in translating. Sometimes, she translated verbatim, used words in their original forms and provided annotations. If this could not be done - or the lines compelled her to do something different - she created some new words or phrases to maintain the flow and mood. “If “doodh bhaat” signified baby food, I had to invent the phrase “mash and milk” in order to stay within the realms of poetry." In the original, Nargundkar says, the mother offered a lot of emotional cues that made it easy for her to understand what exactly the feeling was that she had to translate. However, the daughter offered relatively fewer cues of this nature - with the exception of her angst at being adopted. Nargundkar decided to interpret the silence as its own form of communication. Her aunt’s original novella was translated into Hindi and won a major award for translation. However, how did the fact that she was translating a story that belonged to a member of her family, indeed, to a family tradition specific to women (these kinds of traditions being common to many oral storytelling cultures), make her translation different? Nargundkar acknowledges that Marathi has a very rich oral tradition of songs that women sing while doing their daily chores or on special occasions. These songs often tell stories of women’s lives and are replete with colourful vernacular and domestic imagery. Vaidya drew from this tradition - however, she also experimented with the tradition and stepped out of its traditional form by “us[ing] verse in a…ballad like fashion to tell a whole life story…[and by using the] sustained imagery of life as a game played on the worldly board.” As a reader of her aunt’s work, Nargundkar perceives the usage of verse adding a dramatic, conversational tenor to the tale. So while the heritage of this familial writing and storytelling culture is traditional in places, it is also unorthodox in places. “I hope to take this tale from its very local setting to a wide global readership, and the English translation will allow this. There is a new and growing interest in international adoption, and for that matter, in surrogacy, to create or grow a family, or to provide homes to children that have been orphaned by disease, war, and poverty.” She hopes that the message this book gives - that powerful love can be found in adoptive relationships despite the stigma of adoption whereby adoptive families like the one in Rag Doll “are never allowed to forget that they are not of the same blood in the worldly sense” - will help readers grappling with such issues. The Shruti she talks about here is not the translator, but graphic designer Shruti Shyam, who was brought in to be the illustrator. Shyam had been working with Zubaan on various other projects, and the editors loved her style. Ishani, editor of Young Zubaan, says “I thought it would be the kind of challenge that she'd rise to.” They checked with Shruti Nargundkar and Anuradha Vaidya, both of whom loved the idea, and once the illustrations and text were put together, “they seemed a perfect kind of fit." Shruti Shyam, 24, is a graphic designer, artist and Ultimate Frisbee enthusiast, currently studying at the Savannah College of Art and Design. When she isn't busy illustrating and designing book covers, she can be found exploring the streets of Savannah on her trusty bike, trying to get lost. 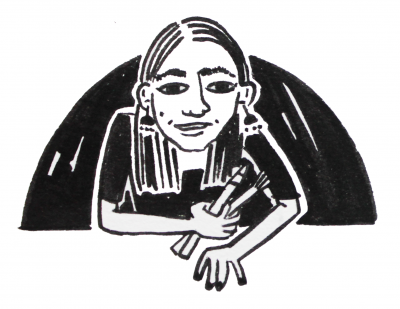 When Shyam first read the poems, she was struck by the raw emotion that came through. She knew she wanted to create black-and-white illustrations, to express visually the darkness in the poems. She tried a vector variation of the illustrations, but in the end, the simplicity and evocativeness of hand-drawn, black-and-white illustrations won out. While all this was happening, Urvashi came across something interesting - Tsunamika dolls. A member of Dastkar brought a bunch of these dolls to the office, which were then distributed to everyone. Tsunamika dolls were a project of Auroville, which was aiming for a kind of community therapy through creative work. Afflicted fisherwomen created the dolls with fabric left over from Upasana Design Studio’s products, to overcome the trauma of the tsunami of 2006 through creative work. Shyam decided to share what she saw in her mind while reading the book with the readers. Her illustrations would subtly cue the reader to details that were not there, in a literal way, in the novella, but instead were evoked in the mind of a reader - herself. These details pointed to the processes of reading and illustrating - which were themselves other kinds of translations that a work of literature goes through. “Details such as the way the mother ties her sari and the changing patterns on her daughter's clothing give the reader certain details…[about] where they are from and how well the mother cares for her daughter…that may not be a literal translation of the text.” What’s fun for her about being an illustrator for a book is the creative freedom to interpret the text. To share her interpretation with readers, she says, is a huge honour. We are curious about what Shyam thinks of the idea of an illustrated book for adults. She admits, “It is a bit of a challenge to steer away from the assumption that a picture book, or a book with illustrations is only aimed at children…[j]ust because a book is illustrated, it does not mean it is a children’s book. I may not be speaking for every adult out there, but I certainly enjoy looking at interesting visuals alongside large chunks of text.” Even through e-mail, I can sense her animation about the topic of who illustrations are for. Tsunamika dolls. Image by Upasana Design. Illustrations, she says, generally give readers visual cues as to what to expect out of the story - whether they are direct or abstract. They are also evocative of feelings, which is one of the important things she hopes her illustrations will accomplish for this book, which is very much about emotions. Shyam believes that children are incredibly intuitive and see things in ways that adults cannot; also, illustrations make things easier to understand for people new to reading. That’s probably why children love illustrations. She seems to be saying that illustrations are not necessarily a replacement for words - although sometimes, of course, they can and must be - but sometimes, they are an accompaniment for words that provide the reader (no matter their age) a different medium through which to experience the story, and sometimes, they are the story.